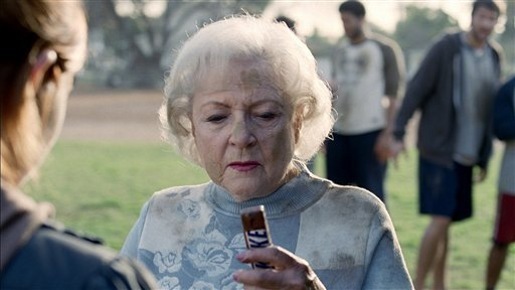 Betty White, 88 year old American actress comedian and former television host, turned football player in a high profile commercial for Mars Snickers in the 2010 Super Bowl. White’s game appears sluggish until she takes a bite of a Snickers bar. “You’re not you when you’re hungry”, says the voiceover. The spot finishes with Abe Vigoda having a go. The spot is currently number one in the USA Today Ad Meter. The Betty White ad was developed at BBDO New York, by chief creative officer David Lubars, creative directors Gianfranco Arena and Peter Kain, executive producer Amy Wertheimer. Filming was shot by director Craig Gillespie via MJZ, Los Angeles, with executive producers David Zander, Lisa Margulis, and producer Martha Davis. Editor was Ian MacKenzie at MacKenzie Cutler with executive producer Melissa Miller and assistant editor Mona Salma. VFX were produced at MassMarket by VFX supervisor/2D Lead Nick Tanner, VFX producer Kyle Wright and executive producer Justin Lane. Colorist was Tim Masick at Company 3. Mixer was Tom Jucarone at Sound Lounge.